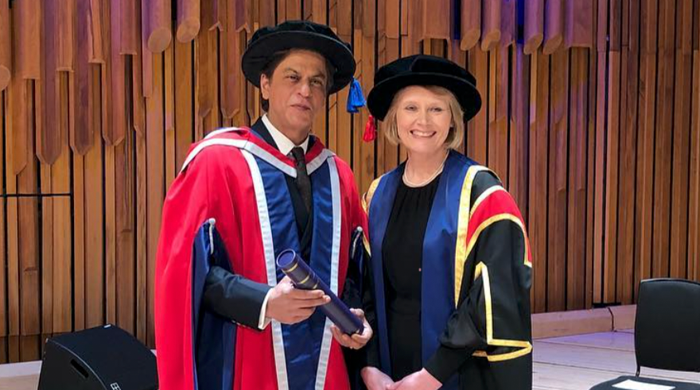 The University of Law (ULaw) has awarded Bollywood megastar turned champion of justice, Shah Rukh Khan, an honorary doctorate in philanthropy. The award comes as recognition of Khan’s public-spiritedness outside of India’s film industry. Beyond the big screen, Khan is known for championing human rights, access to justice and crime prevention in India, as well as his work with several charities, including the Make-a-Wish Foundation. This is Khan’s third honorary degree, having previously received doctorates from the University of Edinburgh and the University of Bedfordshire for his contribution towards art, culture and charitable causes. ULaw also awarded an honorary doctorate to Guy Beringer QC in recognition of his work as chairman of the Legal Education Foundation, a charity dedicated to the advancement and support of legal education in the UK. Also picking up an honorary doctorate was diversity campaigner Miranda Brawn for her work as founder and CEO of the Miranda Brawn Diversity Leadership Foundation, a non-profit organisation that aims to increase diversity and inclusion, particularly within the workplace. Absolute hero! Well done King Khan. I love reading about diversity. Anything really – just stories about non-white people doing non-shite stuff. Just makes me feel so optimistic about the future. More please Legal cheek. Oh, please say someone gets this comment!! Why delete my comment about SRK being a DON? It’s a brilliant fillum and you should watch it. It is a brilliant fillum and you all at LC should watch it. The censorship at LC is getting way out of hand. They do know many people mainly come here for the comments section right? Almost on par with the Oxford LLD. Well done sir. No, it ain’t.. are you dumb or what? I do not understand why this is even remotely newsworthy. It is not. It is rather transparent click bait marketing.